Like everybody else around us, we also have some career goals in our mind. The time when we decide on what streams we would choose for further studies is paramount. Be it any stream of studies, passion combined with hard work and persistence is the only ingredient to great success. Likewise, Commerce Stream brings with itself a plethora of opportunities for students. A young commerce graduate would find ample opportunities in different lines of work from marketing to finance. 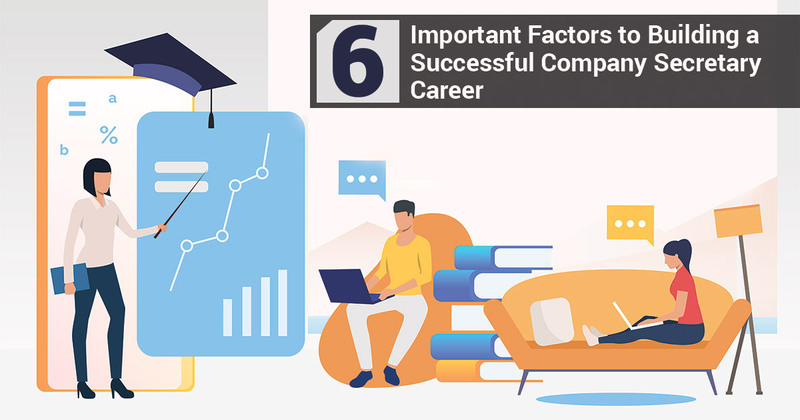 In this blog, we try to highlight two popular career paths for commerce students i.e Company Secretary and Chartered Accountant. 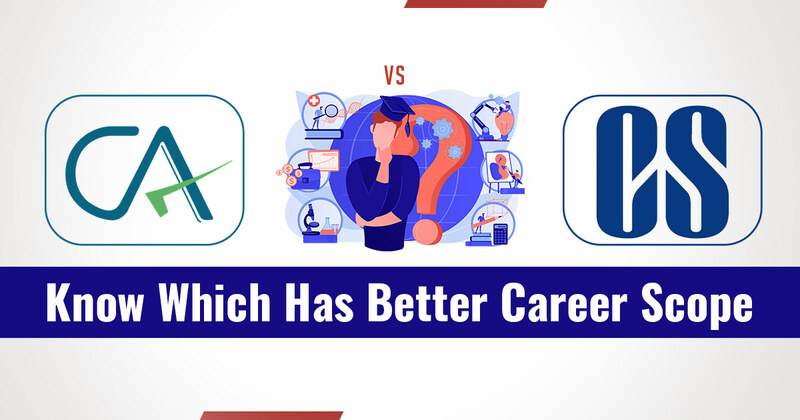 We hope by the time you finish reading this you will have a clear picture of the pros and cons of the two professions and accordingly chose the right one as per your interests. What is Chartered Accountancy (CA)? There is an old quote which goes something like this… “If you want to get rich in life son, hire a great accountant”. There are universal laws like Water is blue in color. The former quote is pretty close to being a universal law. CA course is one of the most esteemed professional course in India. There are no prerequisites for taking up the course. However, a commerce background brings with itself some advantages. But clearing the CA exam can be an uphill task. It requires resilience and the ability to study for a long duration and by duration, we mean months and years. The course requires in-depth study and more involvement. If you can clear three levels in one go, you would be able to become a CA within 3 years. Having said that, most people don’t clear it in one go or even in two-three attempts! 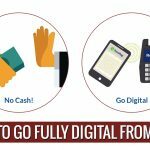 But in today’s digital world, you can gather enough insight and get expert guidance via various Chartered Accountant websites, YouTube Channels as well as CA blogs. So keep your spirits high and make a deep plunge into the universe of stats and numbers. Keep persistence and hard work as your companions on the journey. There is no reason why you won’t reach the pinnacle of success. What is Company Secretaryship (CS)? The company secretary is also an equally good professional option for commerce and other graduates alike. There are immense opportunities and scope for CS professionals in the field of the private sector, public sector, banks, stock exchange, law firms, and other financial institutions. Providing support to the administrative block of the organization they associate with. Manage proper/legal corporate governance as well as ensure proper implementation of the organization’s collective decisions. In the bygone era, cracking Company Secretaryship exam used to be easier. Today, however, a CS profession demands an equal level of dedication and hard work if not more. The filtering process of the CS Authority is stricter than ever before. Very few survive and clear all three modules. Imagine the scenario, only 3 people out of 100 clear all three modules last year. Because of this, the value of CS is now at par with CA. However, with e-learning platforms, you can now get lectures and other resources online via various Company Secretary websites, YouTube Channels as well as CS blogs. Imagine yourself 10 years from now, advising CEO and Managing Director of big companies. If the thought brings chills than Company Secretary course is the right path ahead for you. Corporate sector companies seek expert advice from a CS on corporate law and practice as well as even request drafts on law-related subjects. There are many key differences between CA and CS, though they both are equally hard and sought after courses. Quantitative ability and Qualitative ability are two paramount discerning factors between the two professions. A CA’s profession demands quantitative ability whereas a CS needs to have a more qualitative approach to his/her career. The analytical skills of a CA should be top notch and he must be at the Zenith of his capability when handling numbers as well as pressure.CA needs to accurate in every number and there’s no room for errors. CS, on the other hand, should be very good in law and management. Good Communication skills are a must for a CS as She/he needs to advise the board of directors of the company. CA’s core course of study revolves mainly around accounting. Though some later modules cover various domains to make the course more comprehensive. In short, the focus of CA course is quantitative. On the other hand, the spotlight in case of CS course is on corporate laws. To enhance communication skills CS course is made qualitative. The last module even covers HR management. To summarize, CA is more selective as it includes various subjects; whereas CS is more global as people at ICSI (Institute of Company Secretaries of India) understand the value of soft skills along with the technical skills. An advantage of having a CA degree over CS is that CA has the authority to defend his/her client and can act as a lawyer. But a CS cannot defend his client or represent him in any case. CA’s are primarily employed by audit and consulting firms as well as firms with global footprints. CS’s, on the other hand, are hired by public enterprises and government organizations. CA’s are generally the first preference in jobs related to the financial domain. CA’s are the first choice for jobs demanding in-depth knowledge or expertise as well as strong analytical skills. This does not, however, demean the job profile of a CS. It’s equally good. The pay scale for a CA is almost double to that of a CS. This difference in salary is mainly driven by the authority and power of CA exercise in favor of his/her clients. 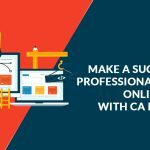 CA is a professional course that adds immense credibility. Even if you don’t want to join a company, you can do your own practice. And develop clients on merit. CA is easily employed by a large number of existing private Chartered Accountant firms. Capital Markets benefit a lot from their expertise and hence demands are always high. A qualified Chartered Accountant can work for Government Service, Public Sector or even in the Private Sector. It is a myth that a CA’s work involves only numbers and excel sheets. A CA employed by a firm can also contribute towards decision making and enhancement of profits for the firm. Make In India and 100% FDI schemes have further accelerated demand for CA’s in the manufacturing and financial services sectors. A CA unlike other employed professional’s is free to take a break in his / her profession. Certificate by the Institute of CA of India is globally recognized. One can even practice in England, Australia etc. Read Also: Why CA, CS & Lawyer Professionals Need Their Own Website? The Institute of Company Secretaries of India (ICSI) is widening the reach of CS professionals not only in India but across the globe as well. The exam is conducted by the institute and over the years CS pass out from the institute have enjoyed great opportunities and respect. Corporate sector and growth in the corporate sector lead to involvement of legalities and legal complications. CS professionals are treated as an authority on company laws and communication. Both factors govern the smooth functioning of any corporate level organization. CS can directly advise the board of directors and they will act as you say in legal matters. But always remember with great power comes great responsibility. CS professional expertise in Law are highly sought after by Government-backed Financial Institutions, Stock Exchanges, Nationalised Banks, Department of Company Affairs etc. we would advise you to chose any of the above professions from your heart and dedicate yourself with passion, everything else will follow suit. 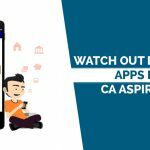 There are enough CA and CS websites nowadays to help you out in case you get stuck on the road to success. All the best and Adios for now.